After posting the results of the Choo Choo Quilters Guild Challenge, A Novel Idea, I was asked which Challenge piece was mine. You saw the back of this quilt in an earlier post. Here is the view of the front. The book was "Steve Jobs" by Walter Isaacson and my inspiration sentence was: "They had grown up among movie stars, but to them Jobs was a true celebrity." Artist Statement: "I am a long-time Mac user and my heart broke upon hearing the news of Steve Jobs’ passing—just a year ago—on October 5, 2011. This quilt is a tribute to him. The innovative piecing technique was a perfect choice to illustrate Steve’s out-of-the box, futuristic vision for Apple and the information, communication and computer technology industries. I confined my fabrics to solids, challenging myself to create something visually and aesthetically interesting without the use of prints (my usual palette). After all, Steve did brilliant and beautiful things with 1s, 0s, and circuit boards. The hand stitching reminds us that a human factor is still a required force behind any technology." 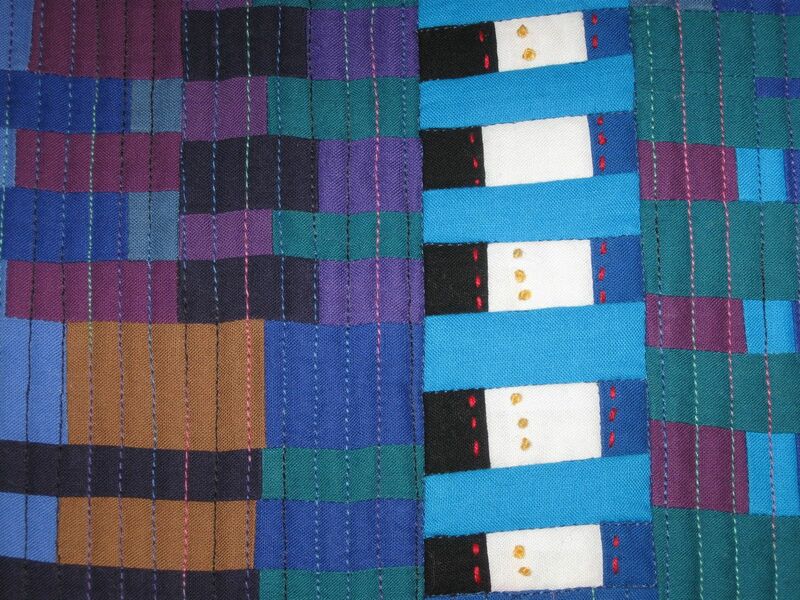 Detail: hand stitching and French knots. The finished size is 16-3/4" x 18-1/4" and the quilt has a facing rather than a binding. I worked with solid fabrics, which I was introduced to this past summer in a workshop with Nancy Crow. 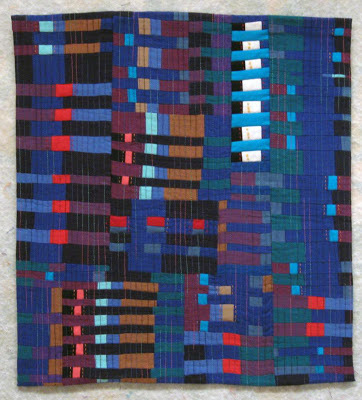 This piece also offered me an opportunity to practice the strip piecing techniques she taught us. Some interesting viewer comments about the piece included that the black fabric reminded them of the black shirts that Steve Jobs wore. Another said that the piece looked somewhat like a computer circuit board. I did not consciously think of these, however, maybe my "inner Mac" came out as I worked. For me, the red, turquoise and light blue squares represent the other movie stars, and the white—a more clear and the brightest color in the composition—represents Jobs. Overall, I think this is a successful piece and I enjoyed working on it. 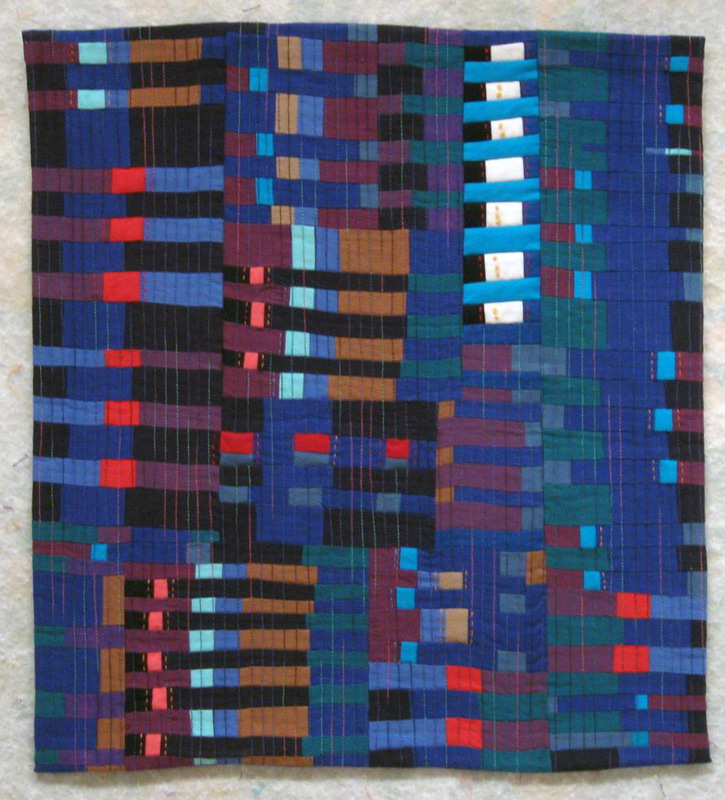 I love to hear the insights from viewers and other quilt artists. I find it interesting what others see in a piece. What do you see? I'd love to know.